Exploring Lisbon with kids was our first adventure in Portugal. Lisbon was always a destination that Christina and I had fantasized about exploring. The magical castles, cobblestone streets, and exciting riverfront were things we were dying to explore. And the food! Ahh, the scrumptious Portuguese food was something we were dying to experience in Lisbon with children. Lisbon is incredibly popular with European travel families, yet many North American families tend to skip it for more popular travel destinations in Europe. 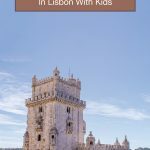 But Lisbon is one of our favorite cities, and it is well worth the time to get to know what it’s like visiting Lisbon with kids. 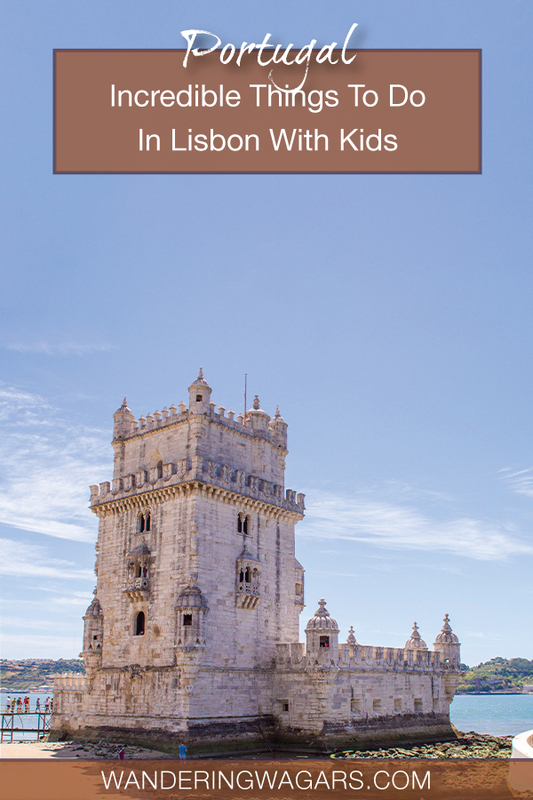 What Do You Need To Know Before Visiting Lisbon With Kids? What Is The Weather Like In Lisbon? Is The Water In Lisbon Safe To Drink? Do You Have To Pay To Use The Toilets In Lisbon? Portuguese life often revolves around family. 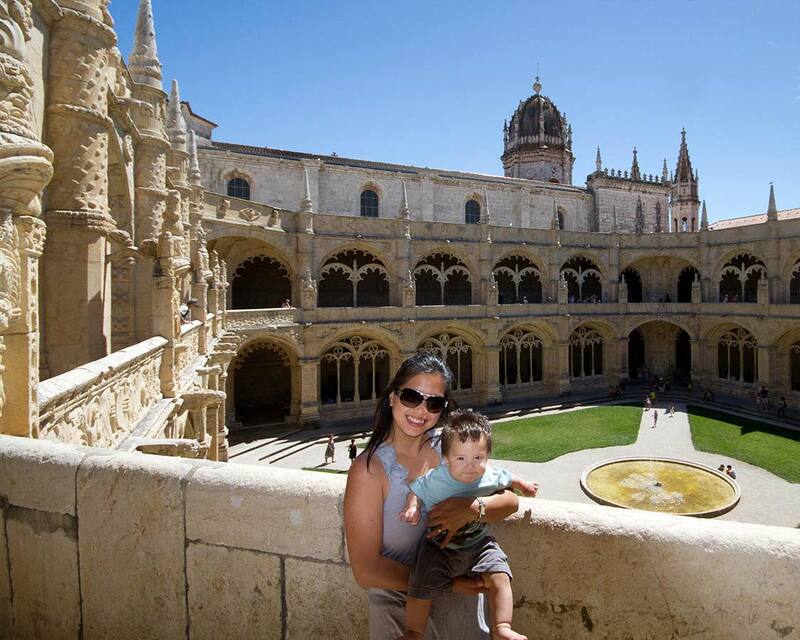 This family focus helps make Lisbon a warm and inviting destination for families, especially those who visit Lisbon with young kids and babies. The city of Lisbon in Eastern Portugal is at the mouth of the Tagus River. 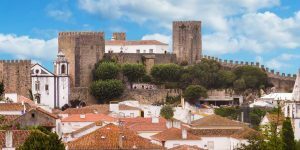 It features rows upon rows of buildings appearing like stairs reaching up along the steep hills of the city, crowned with the beautiful Castelo de Sao Jorge. The city is painted in combinations of pastel-colored paint and gleaming white and blue painted tiles. Many of the streets of Lisbon are cobblestone making the picturesque surrounding even more beautiful. However, those cobblestone streets make navigating Lisbon with a stroller difficult. It’s best for children to either walk or be carried in a child carrier. The layout of the city definitely makes exploring Lisbon with kids a challenge, but if you plan well and give yourself time, Lisbon can be a fun city for the whole family. We’ll have some more tips further down the article to help you plan your family holiday in Lisbon. Portugal is, by European standards, a relatively inexpensive family travel destination. By purchasing a Lisboa card on your family trip to Portugal you can save quite a bit of money on attractions in Lisbon for kids The Lisboa card offers free or discounted admission to many of the attractions in Lisbon. The Lisboa card comes in three packages, 24 hours for 19€, 48 hours for 32€, and 72 hours for 40€. There are discounts available for children, so you’ll be able to hit many of the top things to see in Lisbon. 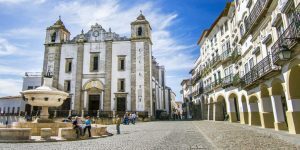 Visiting Portugal with kids is an excellent option for family travel, and Lisbon is an excellent option for parents looking to combine history, adventure, and excitement into a family vacation. 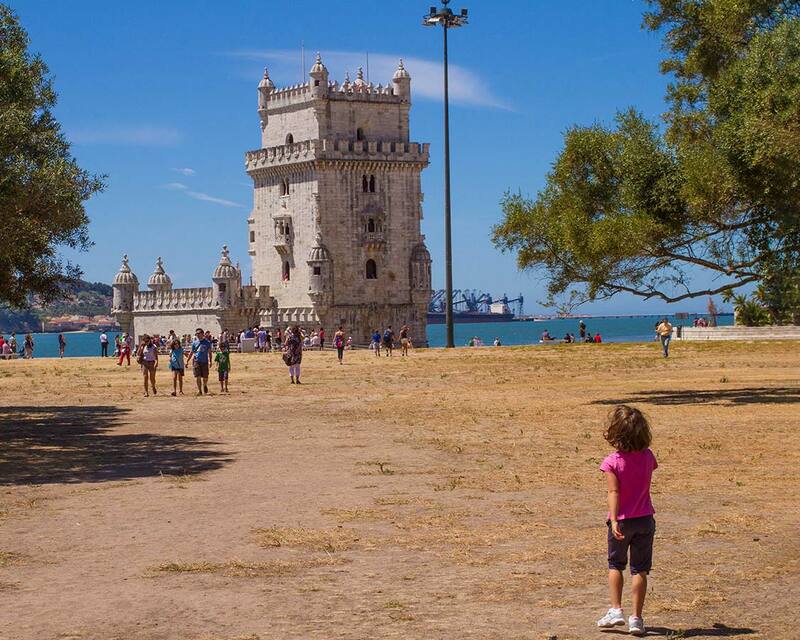 Here are some of our favorite things to do in Lisbon with children. It’s difficult not to notice the imposing specter of St. George’s Castle in Lisbon. For most kids in Lisbon, it’s one of the first things that they’ll point out, because, castles are always awesome! Castelo do Sao Jorge is visible from most places in Lisbon, yet, getting here can be a challenge. 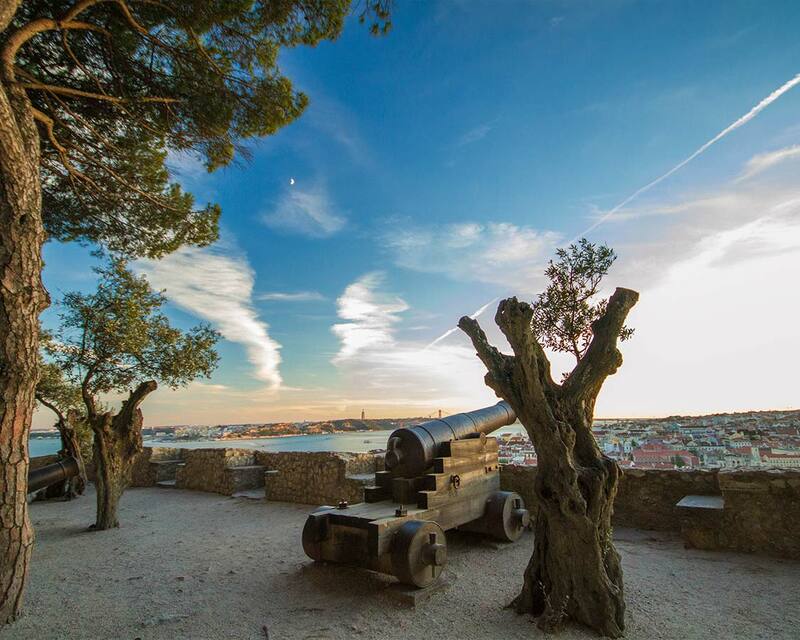 There are seven hills in the city of Lisbon and the 6th century, St. George’s castle is at the top of the highest of these hills. Its strategic position made it the best place for the Portuguese Royal Family to call home since the 1500s. The views from St. George’s castle are stunning, and if you can time your visit to sunset, you’ll be in for a treat. 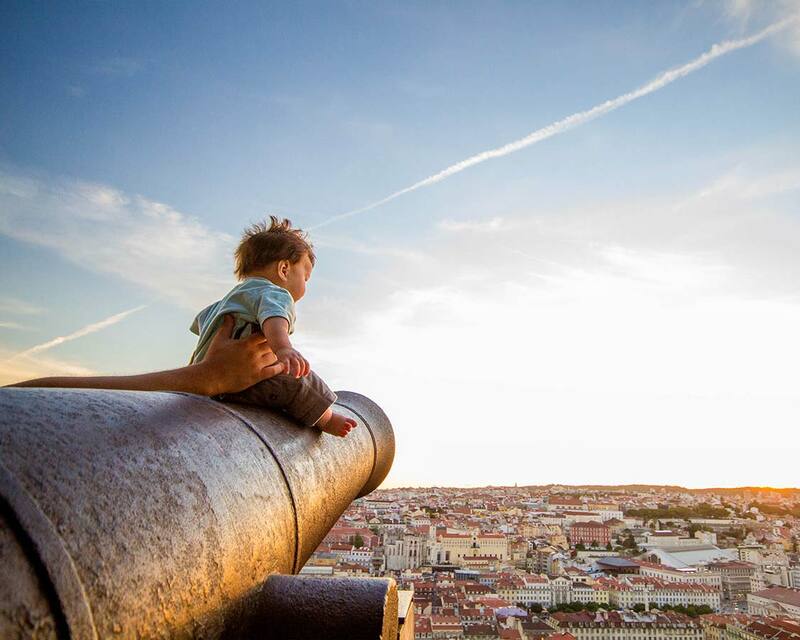 Kids in Lisbon will have a blast exploring the battlements, cannons, and castle walls. Exploring inside may even find you face to face with some of the local peacocks. Pro-Tip: Many of the walls have no railings and have steep drop-offs. Younger kids should be kept close to avoid falling or missteps. Lisbon seems to only go in two directions, up and down. The seven hills that makeup Lisbon help contribute to its beauty. And the stunning views from the peaks offer legendary views of the city and the Tagus River at its base. But what makes the city so beautiful also helps make traveling through Lisbon with kids so exhausting. One great way to take the strain of hill climbing off of the whole family is by boarding the number 28 tram. 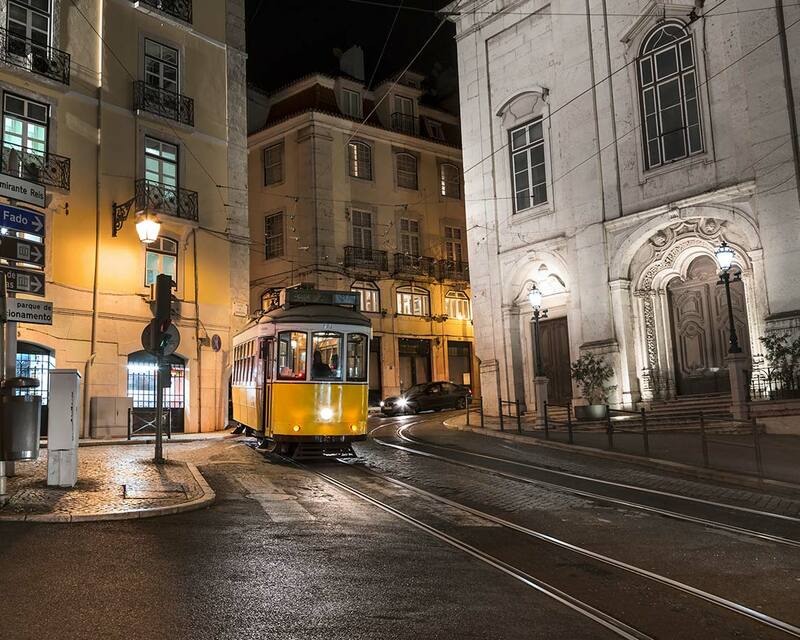 The Tram 28 cable car slowly winds its way up the streets of Lisbon as it loops past some of the most famous Lisbon attractions such as the Lisbon Cathedral, the Basilica de Estrela, St. George’s Castle and the picturesque Alfama neighborhood. The 28 Tram in Lisbon with kids is one of the best budget options in Lisbon, costing just 2.80€. The price of the 28 Tram in Lisbon is covered if you purchased a Lisboa card. Pro-Tip: The Tram 28 is a notorious location for pickpockets. Keep a close eye on your wallets and purses. Keep your articles in-sight and close to your body. 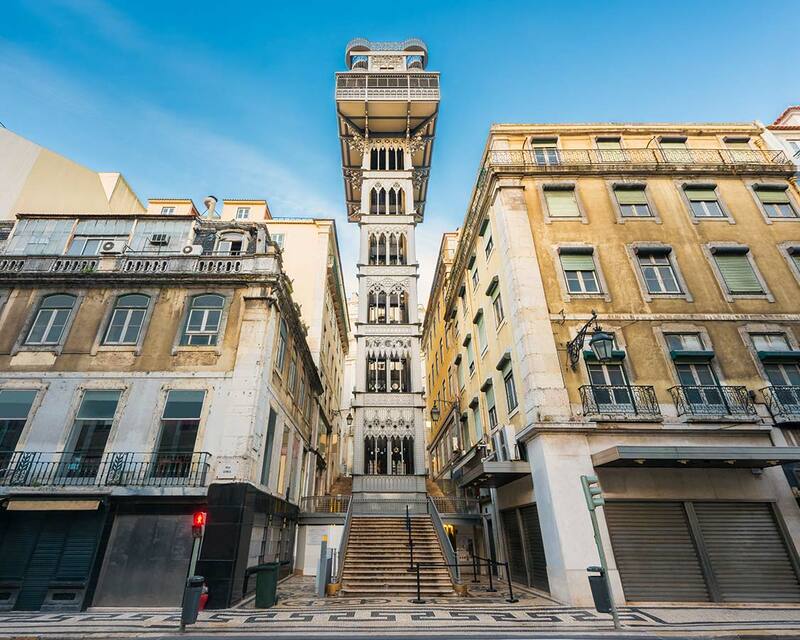 The Santa Justa Lift took the challenges of getting around central Lisbon and decided to lift them up. The Santa Justa elevator, designed and built in 1902 is a beautiful solution to, what was before, a system of animal-powered funiculars that powered the Lisbon transit. But the engineer, Raoul Mesnier du Ponsard, didn’t just create a functional tool, he created a regal, gothic design that may just be one of the most gorgeous elevators in the world. The Santa Justa Lift leaves every 7 minutes, and a spiral staircase at the top brings visitors to a lookout platform that offers some of the best views of Lisbon. The Santa Justa lift is included in the Lisboa pass. Otherwise, the price is 5.15€. The main plaza in Lisbon is the Praca do Comercio, and it is full of incredible experiences for kids. Like a typical European square, expect children to run off chasing flocks of pigeons. The dramatic Triumphal Arch welcomes visitors into the plaza. And, when the sun goes down, the Praca do Comercio is lined with talented street artists from fire eaters to jugglers. The Praca do Comercio is also the location of the Lisbon tourism office, a good place to pick up the Lisboa card. 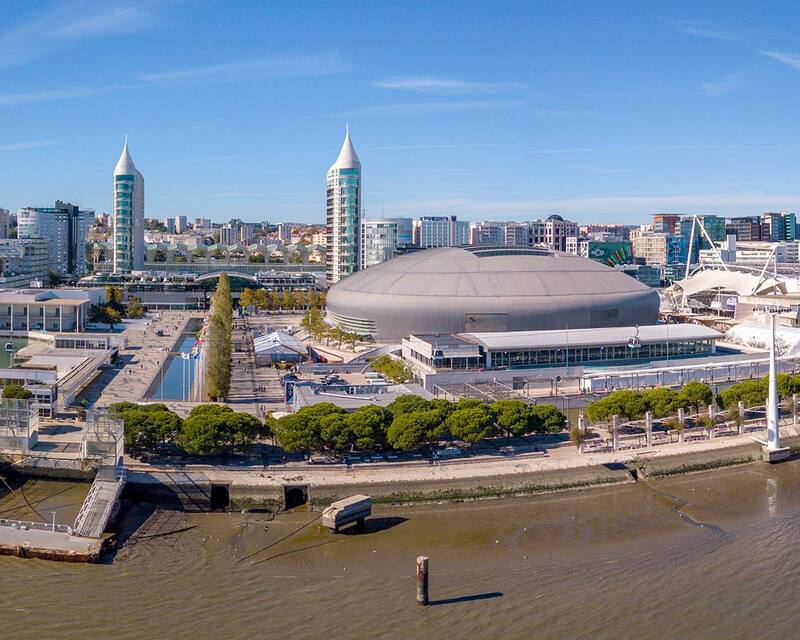 Parque das Nacoes (Parque das Nações) is a modern area of Lisbon that has been developed to combine both new, modern condos, and spectacular Lisbon attractions. If you are looking for a fun day out in Lisbon, a visit to Parque das Nacoes should be at the top of your list. There are cable rides, waterfronts, museums, playgrounds, and much more here. Parents will love the cafes and restaurants, and kids will love almost everything else! One of the most popular places to visit in Lisbon with children is the Aquarium of Lisbon, the Oceanario. Not only does the Lisbon aquarium house over 8,000 species of marine life but it also offers a welcome respite from the heat during Lisbon in summer. The Oceanario is located in the Parque das Nacoes, which is a center for family fun in Lisbon, so you can make an entire day of the experience if you wish. Admission to the Lisbon Oceanario is free for children under 4, 12€ EU for children 4-12 and 18€ for those 13 and above. You can save money at the Oceanario by purchasing a family pass for 47€ for the complete exhibit and 39€ for the permanent exhibits. And what is great about the Oceanario in Lisbon for kids is that they won’t see any large mammals that should not be housed in cramped aquarium spaces. It’s a great place to explore undersea life with children. The Lisbon Science Museum is a fascinating destination for those who are spending a week in Lisbon with kids. The Pavillion of Knowledge, which is also located in Parque das Nacoes, is a highly engaging, interactive science museum in Lisbon focused on those 4-years-of-age and up. There are amazing hands-on activities for children that will keep them busy and excited for hours. The entrance fee for the Pavillion of Knowledge is 9€ for adults and 6€ for children. Children under 2 years old are free. The Monastery of St Jerome is one of several UNESCO World Heritage sites located in Lisbon’s Belem region. This ornately decorated complex was built in the age of Manuel I, the King of Portugal at the time of construction. 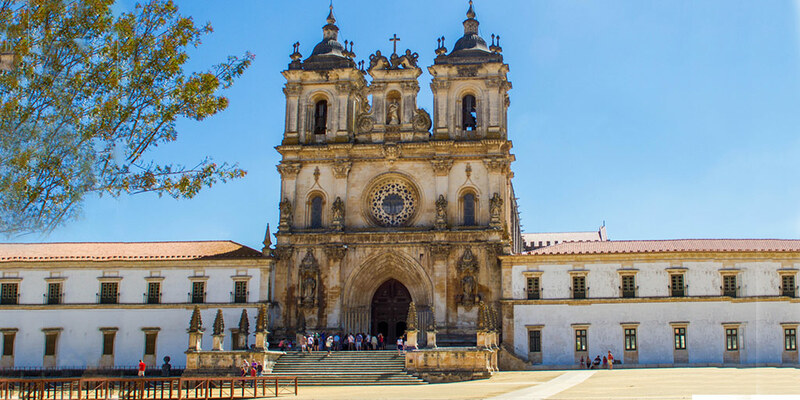 It was originally built to honor Portuguese explorers including the notorious Vasco de Gama but was eventually transformed into a monastery during the 1600s. The beautiful gardens and colorful grounds are a treat for parents exploring Lisbon with children. The intricate cloisters and vaulted ceiling make the rooms feel enormous. There can be long lines to enter the Mosteiro dos Jeronimos however, so arriving early can help you save some time. Entrance to the Monastery of St. Jerome is 10€ for adults, while children 12 and under are free. There are long lines at the Monastery of St. Jerome, it’s best to arrive early in the day to avoid the lines. You can purchase a ticket that combines the Monastery of St. Jerome with the Belem Tower for 12€. There may be no place in Lisbon that children are more excited to visit than then famed Pasteis de Belem. This legendary pastry shop, just steps from the Monastery of St. Jerome, has been serving some of the most delicious pasteis de nata (Portuguese custard tarts) around since 1837. Grab some of the local delicacies to munch on, and make sure you send some over to me! There are few buildings in Lisbon more iconic than the Torre de Belem. Kids will be mesmerized at this isolated tower, at times cut off from the mainland by the tide. And when they aren’t playing using sticks as swords to defend the tower, they’ll be exploring the surf looking for jellyfish. The Belem tower is connected to land by a bridge, and a stroll through the tower in Belem will bring kids face to face with gargoyles, dungeons, and royal decor. The Belem Tower entrance fee is 6€ for adults. Those 14 and under are free. 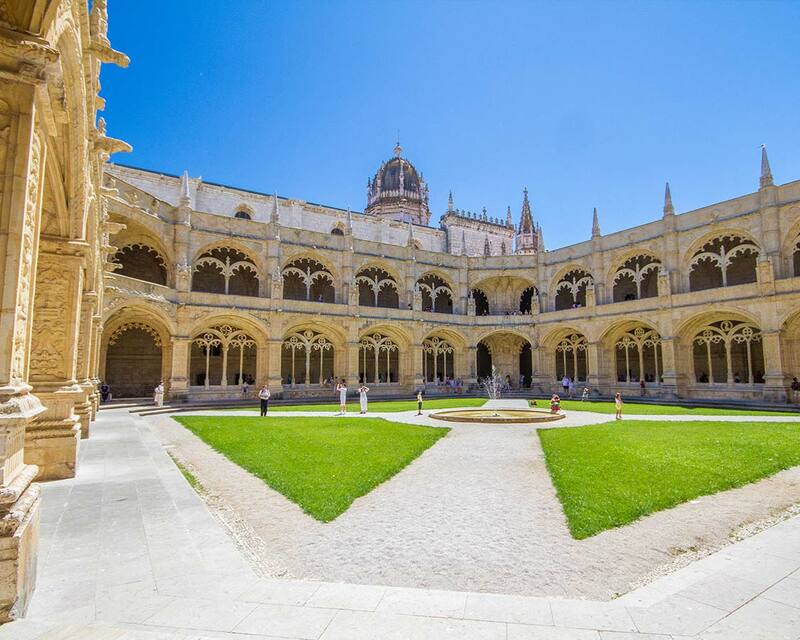 You can save money by purchasing a ticket that combines the Belem Tower with the Monastery of St. Jerome for 12€. For some reason, Ajuda National Palace near Belem doesn’t make it to the list of most people visiting Lisbon, even those not visiting Lisbon with kids. But it should. This palace was built as the home of King Jose I after the earthquake of 1755. The construction of the palace wasn’t completed for 20 years, but what stands here now is a testament to the upper crust of Portuguese civilization during the early 1800s. The line to enter the Ajuda National palace can be long, however, there is free and expedited access available for those with a Lisboa card. Otherwise, the entrance fee for the Ajuda National Palace is 5€ for adults and 3€ for children. 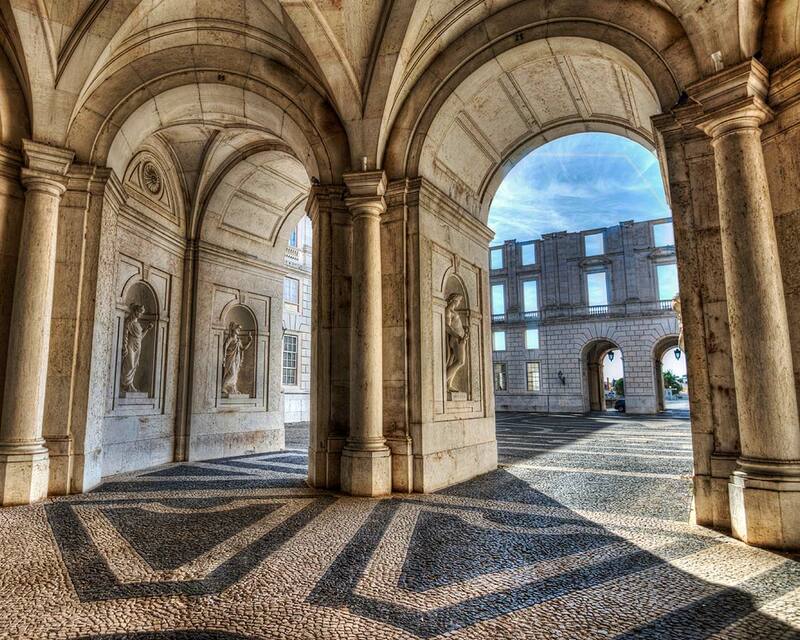 If you’re traveling Lisbon on a budget, the palace is free to enter between 10 am and 2 pm on Sundays. We LOVE the beaches of Portugal. There’s no denying that the Algarve has some of our favorite beaches in the world. But you don’t have to travel all the way south to get to the beach. You can visit the beach right here in Lisbon with kids! There are several great beaches in Lisbon worth experiencing, but one of our favorites is Tamariz beach in Estoril. This beach is located close to the train station and is ideal for a quick getaway from the streets of Lisbon. 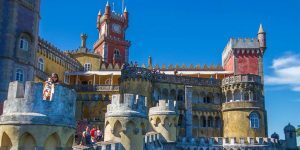 The incredible castles of Sintra are one of the best day trips you can make from Lisbon with kids. 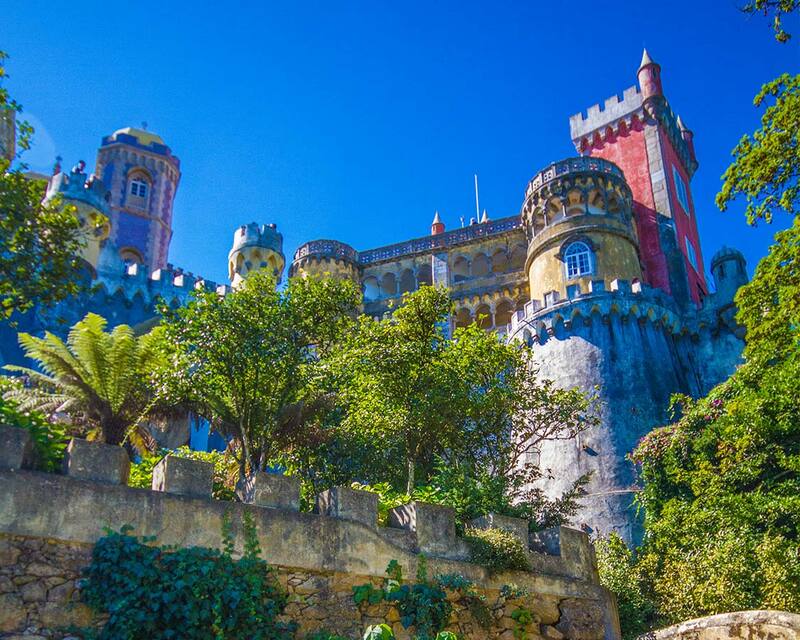 Children will be enthralled by the colorful Sintra Palace and the ancient and mysterious Moorish Castle. It’s best to take transit to Sintra rather than trying to drive. Parking in the center of Sintra is absolutely horrendous. But this magnificent town is one of our favorite places in Portugal for kids. 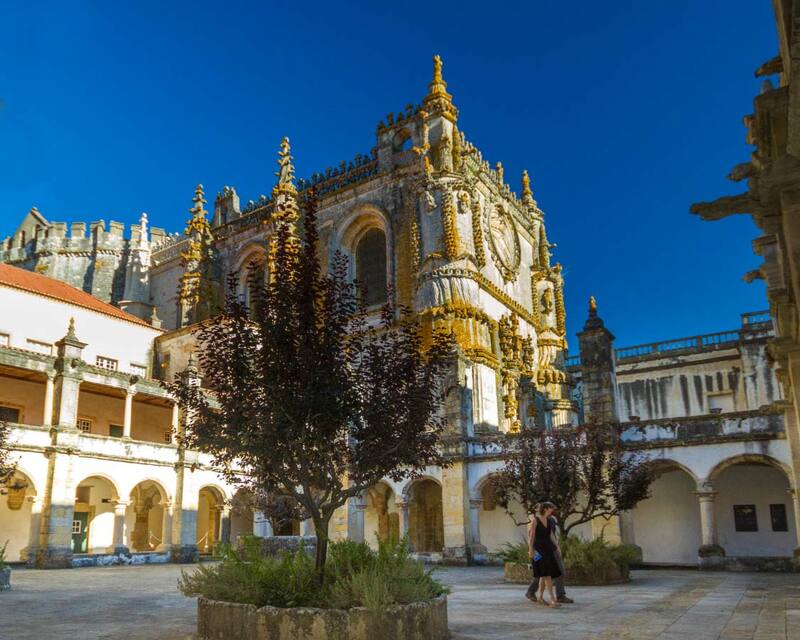 These three spectacular Portuguese monasteries are some of the most beautiful in the country. 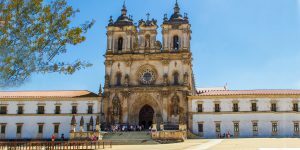 While it’s possible to visit all three as a day trip from Lisbon, it’s best to either explore them over two days or stay one night in Ourem and include the incredible city of Evora in your trip. During the high-season, Lisbon can surpass temperatures of 35°C (95°F). And the sun is especially intense in this city. Make sure that you pack lots of sunblock and a wide-brimmed hat for everyone in the family to ensure that you don’t suffer from sunburn. Because of the high temperatures and the strenuous activity of navigating the seven hills of Lisbon, make sure to drink lots of water. Bring your own water bottle to help curb garbage. Most coffee shops will offer free water if you run out. Just ask for “copa de agua”. The water in Lisbon is generally very clean and safe to drink. Most stores offer bottled water for sale, it usually comes in carbonated (agua com gaz) or flat (agua plana). Unlike many destinations in Europe, there are few public toilets in Lisbon, but those that are there are free to use. Most cafes have facilities open to use for the public. Unless you plan on focusing on newer areas of Lisbon such as the Park of Nations, getting around Lisbon with a stroller can be a challenge. The many hills and cobblestone roads and sidewalks of the older areas of Lisbon can be a challenge for strollers and prams, especially those with smaller, plastic tires. If you’re looking for where to stay in Lisbon with kids, you’re in luck. The Portugues capital has a wide option of both hotel and apartment-style accommodations that are excellent for families. While we usually opt for hotels, at least for shorter stays, sometimes it’s great to have access to a kitchen to whip up a legendary Portuguese feast for the family. If you’re looking for a great combination of apartment-style accommodations and hotel-style amenities, Martinhal Lisbon Chiado Family Suites should definitely be on your list. This Lisbon hotel and suite is located in Chiado and features a kids club and fully-equipped apartment-style amenities. You can find out the rates and availability of the Martinhal Lisbon Chiado Family Suites on Booking.com here or on Hotels Combined here. Located in Belem, one of our favorite regions in Lisbon for kids is the posh Palacio do Governador. This regal-looking Lisbon hotel features family-friendly suites as well as a children’s pool. The gardens of Palacio do Governador are also a beautiful place for children to explore. You can find out the rates and availability of the Palacio do Governador on Booking.com here or on Hotels Combined here. Eating was one of our favorite activities in Lisbon. Portuguese food is rich and delicious. It’s also very affordable. One thing that western children will LOVE is french fries. It seems that everywhere we went, Portuguese french fries tasted exactly like McDonald’s fries. The similarity was uncanny! Now we generally detest eating at McD’s unless there are no other options. But it became a mission for us to try the fries everywhere we went to see if it was just a fluke, or if all the fries in Lisbon were like that. But, beyond the french fries, the food everywhere we ate was delicious, chicken is especially well-prepared here. Here are a few of our favorite restaurants in Lisbon for kids. Restaurant Mili on Calcada de Santana is a popular destination for families. They serve a Mediterranean/Portuguese fusion style of food. Restaurant Mili is generally quite busy, but making it a destination for lunch, rather than dinner can increase the chances of getting a table. The restaurant is tucked away on a back street, so it can be difficult to find, but it’s worth the effort. Fabrica de Nata, located on Praca dos Restaurados is a cafe-style restaurant serving up great Portuguese and European fare. If you don’t get a chance to go to Belem and visit Pasteis de Belem, you should definitely come here for your sweet fix instead. If you’re looking for something heavier, head to Largo Pazz and visit Mestrias, Nova Tasca. This classic Portuguese restaurant serves up delicious meals. And it sits away from the popular tourist streets, so it sees a more local crowd. Have you ever visiting Lisbon with kids? 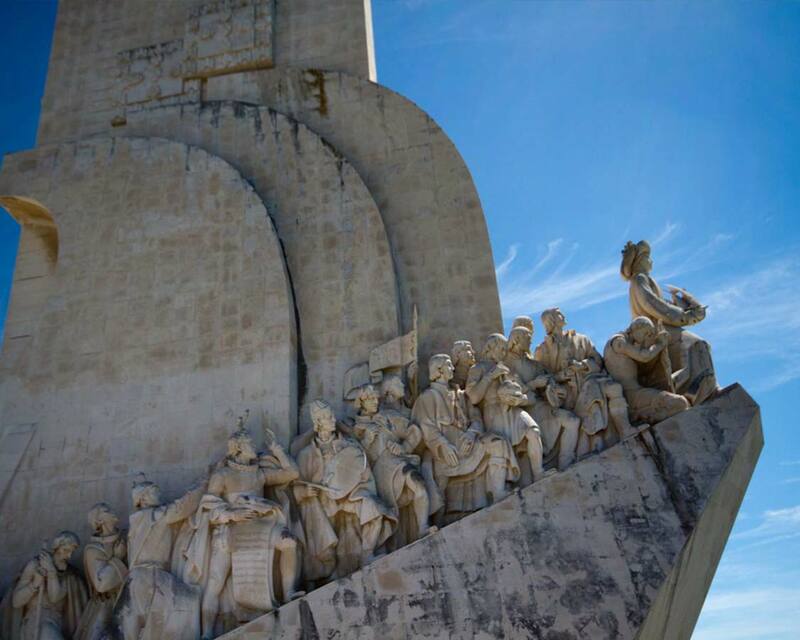 Tell us about your favorite things to do in Lisbon in the comments below. Or you can head to our Facebook page and share a photo. We would love to share in your travels. Tram cars are so much fun Kevin. Blast from the past in many ways. Lisbon in general looks amazing. They sure are! Nothing like stepping back in time with some old school transportation.